Kazlow's Fine Jewelry is an independently owned, discount diamond and jewelry salon. Owner/Operator Chuck Kazlow has over 40 years experience in all aspects of the jewelry industry, specializing in loose diamonds. Originally founded by Buddy Kazlow, Kazlow's has been in business for 25 years at the same location in North Dallas. Chuck has worked in all areas of the jewelry industry from retail, selling wholesale diamonds to retail jewelers, manufacturing jewelry and managing a loose diamond and remount division for a large jewelry corporation. Beti Waits has over 38 years experience. She is certified as an Accredited Jewelry Professional by the Gemological Institute of America and is a member of the National Association of Jewelry Appraisers. 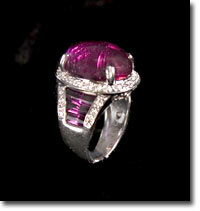 Both have numerous contacts with diamond cutters and direct site holders, watch suppliers, and color stone houses. For your convenience, Kazlow's accepts Mastercard, VISA, AMEX, Discover cards.